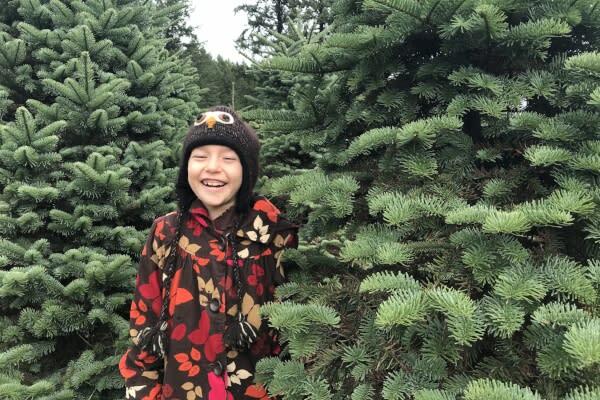 On a rainy Sunday afternoon in early December, my daughter and I went looking for our Christmas tree. We headed northeast on Highway 126 toward McKenzie River - a scenic drive past small farms, through mossy green forests and along the river. During a lull in the rain, we pulled into the Spring Creek Holly Farm with its charming white fences and green fields. At the entrance we were greeted with "Merry Christmas" and given instructions - find the tree you want, tag it and wave down one of the men with a tractor. They will cut your tree for you, haul it back to the parking lot, bail it and help you secure it to your car. Stop by the store on your way out to pay. Easy as that! We headed into the fields with our tree tag. The farm was beautiful and full of happy families milling about. Without saws in hand or the struggle of tree hauling, it looked like everyone was enjoying a carefree walk in the park. In addition to the Noble and Douglas firs, there were trees of holly. We wandered compulsively to the farthest corner in pursuit of the perfect tree. The last few years the local trees have had challenges - a combination of a fungus, warmer than usual summers and wetter winters which have taken a cumulative toll on the slow-to-harvest tree crops. But we found that tree that spoke to us - that cried out "me, me! I&apos;ll look great in your home!" and ceremoniously we hung our tag on it. As easy as that. 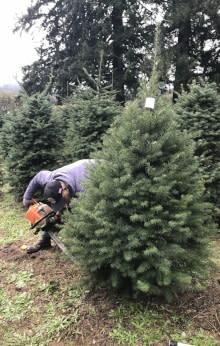 Within minutes we had flagged down a roving staff member with a chainsaw and stuck around to watch him cut the tree down and carry it away to his tractor. At the farm store there were crates of bulk holly sprigs, fir boughs, mistletoe and ornaments for sale. There were also ready-made wreathes and local artisan products. My daughter sipped on a free hot apple cider while I browsed. At check-out they gave her a candy cane and coloring book. Then we went outside, identified our tagged tree and they loaded it on my car. The whole event took less then forty minutes, so we had the whole afternoon left over and continued our Sunday drive. 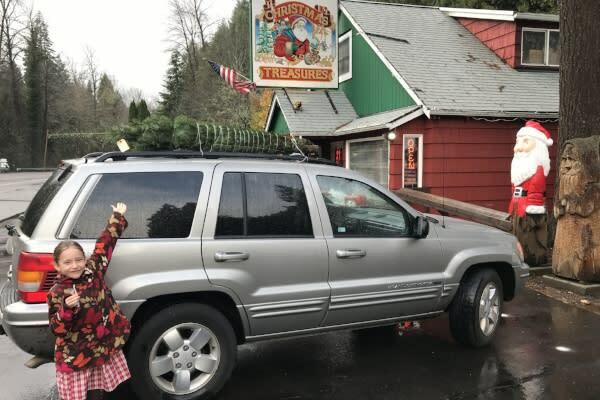 I&apos;m a romantic, and so with the tree strapped to the top of my car and feeling the spirit of a picturesque Christmas, we drove to Goodpasture Covered Bridge. 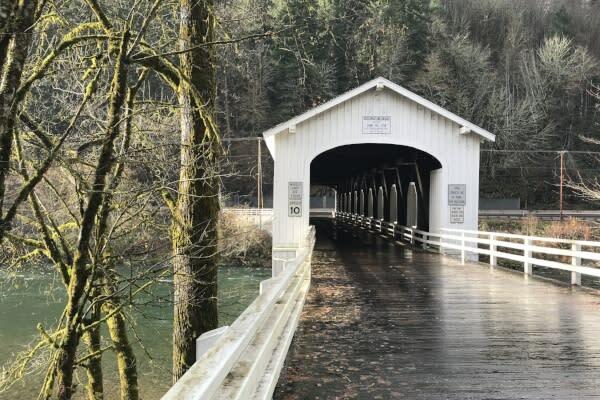 This historic bridge was built in 1938 and is the second longest covered bridge in Oregon. It is also one of the preserved bridges you can still drive through, so of course, that&apos;s what we did. I drove slowly through one way, turned around and drove slowly back through the other way. The interior was damp and light streamed in from the slated windows. For me it was a nostalgic thrill, for my daughter she just said, "Mom, why are we doing this?" My answer, "Because we can! Because we still can!" So the road trip continued along Highway 126. 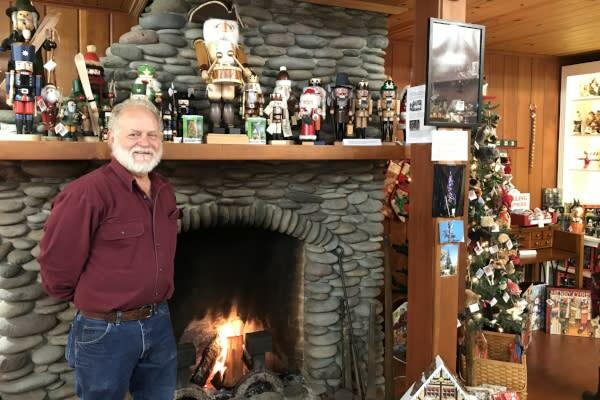 I knew there was a unique Christmas shop ahead in Blue River - an intriguing store that we had never explored. It&apos;s open year-round but if there was ever the perfect time to visit it was now - on a rainy Sunday afternoon with a Christmas tree on the roof and carols on our lips (no car radio so we have to do the singing ourselves). If you need a little holiday cheer, Christmas Treasures is the place. 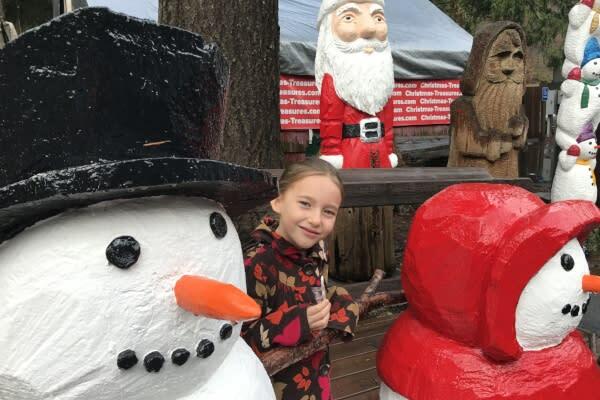 Large and colorful carvings of Santas, snowmen and animals are clustered around the exterior. Owner Patrick Dibala carves them himself. Each larger than life wood carving has its own character and they make for fun photo opportunities (I&apos;m thinking Christmas cards!). Towering above the store is a 165-foot tree which most years Patrick has lit up with glowing lights. He showed me photos of himself scaling the tree to its tippy-top. This year (2017), he is refurbishing it but assured me that the tree would be ready to shine again by next season. Inside the store it feels like a wonderland. Nutcrackers line the mantel above the cozy fire, an elegant sleigh overflows with dolls and stuffed animals, and numerous Christmas trees are decked out in glittering ornaments. From elaborate advent calendars to greeting cards, there is a wide assortment of classic Christmas decor and gifts for sale. I find Scandinavian angel chimes, the kind powered by candles, that I remember from my childhood. My daughter identifies a must-have ornament of a white bird made of natural materials and endearingly fluffy. I realize the longer we linger, the more we&apos;ll want to take home so it&apos;s time to turn around and head back. The drive along the McKenzie River has been beautiful. But now heading home, it is time to plan for dinner. I&apos;d like to make lentil soup and salad but I need a few ingredients - guess I&apos;ll have to stop at the store. But then I see a farm stand sign advertising carrots and salad greens. Well, that would be too convenient! 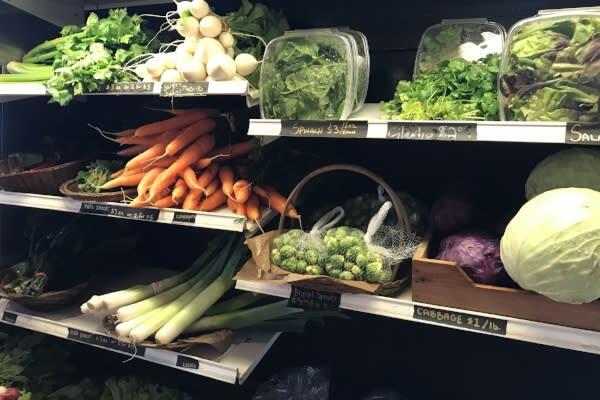 The farm stand is more like a mini-store complete with freezer and refrigerator cases and beautiful displays of organic vegetables and local honey. No one is about but it is obviously open, so I start shopping. I gather the items on my list as well as frozen ground beef and frozen blueberries. I&apos;m ready to pay but still no one is in the store. I approach the counter, thinking perhaps there is a bell or a way to summon assistance. But to my amazement it is self-check out on the honor system. I follow the instructions, recording my purchases on the ledger and swiping my card on the tablet. How wonderful to have this much community trust. I feel like I&apos;ve found a very special place. While I&apos;m finishing up, another visitor stops and brings several cartons of salad fixings to the counter. We exchange greetings and I feel like we are share some sort of exalted local knowledge. We are "in" on this awesome experience. I return to the car with my arms heaped with groceries. Ah, the McKenzie River communities - what a simply delightful Sunday drive we have had. 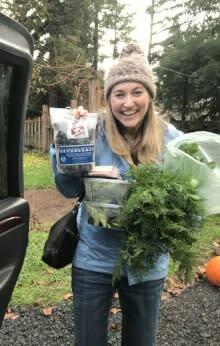 And purchasing these organic, local groceries may have been the highlight of the road trip!